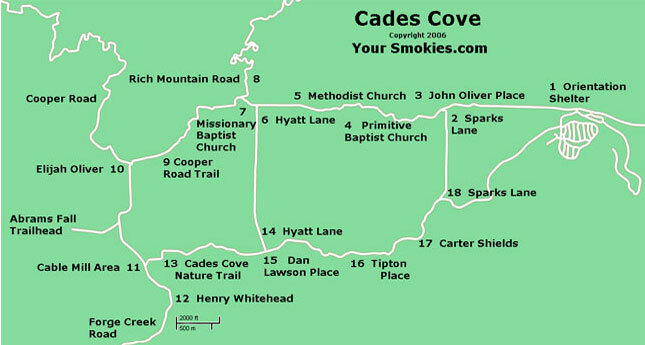 If you visit the Great Smoky Mountain National Park for a day, a week or a year, you haven’t seen the national park until you have taken the Cades Cove Driving tour around Cades Cove Loop Road which is open year round (road conditions permitting) from sunrise to sunset. Sunrise today will be at 07:31 and Sunset will be at 19:14. May 10th to September 27th 2017 Cades Cove Loop Road will be closed to all motor vehicles Wednesday and Saturday mornings until 10am. Hikers and bikes allowed. Other than elk, some fish, insects and a few amphibians, I have observed every animal that I have seen residing in the park in Cades Cove and the surrounding hiking trails that emanate from the Cades Cove valley floor. 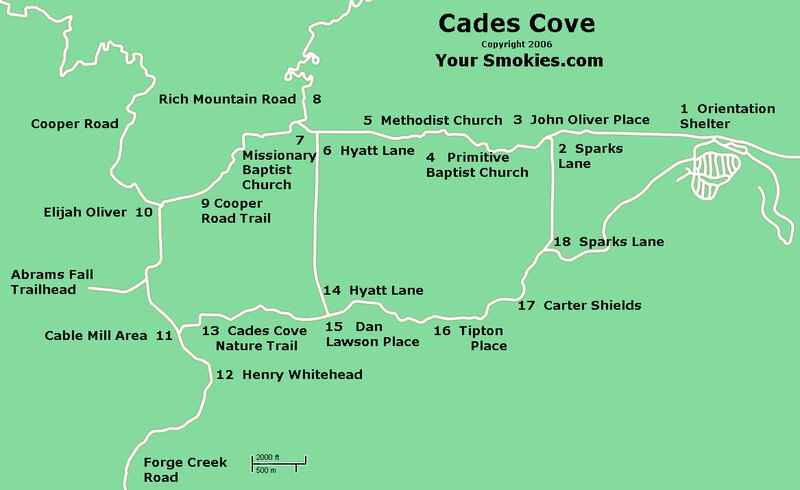 Depending on the time of day, time of the year, day of the week or mode of transportation you are taking, the 11 mile Cades Cove Loop can take anywhere from 2 on up to 6 hours to compete. We locals tend to avoid it on the weekends. 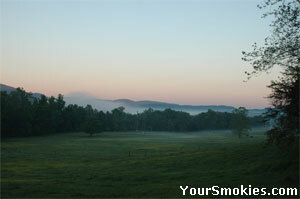 Dawn in mountains surrounding Cades Cove. Yellow spring wild flowers and horses in field. Since this is such a heavily traveled one lane, one way road sees approximately 2 million visitors a year, between the numerous distractions of the beautiful vistas, historic buildings and wildlife crossing the road, delays on the Cades Cove loop are the norm and not the exception. Both patience and courtesy to others visitors go a long way. Peak times where the most visitors are seen in Cades Cove is during the summer months of July and August and the leaf season which runs through mid October into early November. You will also find that in the late afternoon until sunset the traffic increases due the better wildlife sightings and more photogenic lighting throughout the 6,800 acre valley. Cades Cove is located in the far western Tennessee section of the Great Smoky Mountain National Park. It is closest to Townsend Tennessee, formally know as Tuckaleechee Cove, only 9 miles away. Gatlinburg Tennessee is 25 miles away from the Cove entrance and in normal traffic it will take an hour. Cherokee North Carolina is 56 miles, about 2 hours away. There are no food vendors, pay phones or gas stations on the loop. Cell phones do not work in the valley or on any of the trails in the mountains surrounding the valley - even on the peaks there is usually no signal. Halfway through the loop the Abrams Falls trailhead has vault toilets and a little further on a small visitor center that has drinking water and toilets. Before taking the tour, read about the History of Cades Cove and please make sure that you will have enough gas to not only take the loop, but get you back to at least Townsend Tennessee which is where the closest gas station is. As in all areas of the park, disturbing and removing wildlife, plants, rocks and artifacts is prohibited. Fishing is allowed in Cades Cove, but please know and follow the Smoky Mountain National Park fishing regulations as they are enforced. If you wish to take pictures or observe wildlife, do not block traffic but use one of the many turnoffs you will find all along the Cades Cove loop. You will be driving by many fields and meadows and you are allowed to explore, picnic and enjoy any of them by foot. Sometimes horses are tuned out by the Cades Cove Stables into the fields to graze and it is best to not enter fields where there are horses as some may become territorial and aggressive without provocation. What ever way you wish to experience Cades Cove, you will first pass the Orientation Shelter and parking lot at the start of the Cades Cove Loop. If you are planning on hiking the Rich Mountain Loop trail which will take you to the Crooked Arm Ridge trail and the Indian Grave Gap trail, park here and on the right of the entrance gate you will find the trailhead. The orientation shelter has an interesting display which shows how the Appalachian Mountains were formed 240 million years ago and through a series of faulting and uplifting geologic events, and what makes Cades Cove very unique geologically is that the older rocks have eroded away to expose the younger limestone rock. The predominance of limestone in the area help form the rock formations and caves and that dot the area and have altered the soil chemistry and PH allowing plants that would not normally thrive in the park do so. If the sheltered is manned by a volunteer from the park or from the Great Smoky Mountains Association, you can buy books on nature, the park or local history. The proceeds from the sales of any of these items goes directly to the park. When you first enter the Cades Cove loop to the left is a field which in the spring has beautiful yellow and white wildflowers that set off the green grass of the meadows. Often you will find deer or wild turkey in the morning or late afternoon hours. 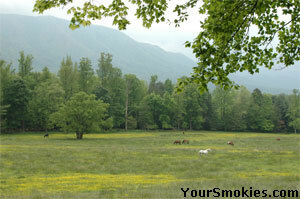 Horses from the Cades Cove Stables are often turned out in this field making for wonderful photo opportunities. If you are going to take pictures here, use the turnouts on the left of the road so you don't block traffic. When taking a picture of the field, be sure to take at least one photograph showing the fence for an interesting mood shot. As you drive further on the right side you will see woods which open into a field with the Cades Cove Mountain in the background. I have spotted as many a 8 deer at once in this field as well as woodchuck and red fox. In leaf season this field offers a wonderful contrast of the green grass of the meadow and the brilliant colors of fall on the sides and the background. Since there are more than 100 tree species in the park, you will find a great variety of fall colors that change as the season progresses.